Objective To determine the effects of stretching before and after physical activity on risks of injury and soreness in a community population. Design Internet-based pragmatic randomised trial conducted between January 2008 and January 2009. Participants A total of 2377 adults who regularly participated in physical activity. Interventions Participants in the stretch group were asked to perform 30 s static stretches of seven lower limb and trunk muscle groups before and after physical activity for 12 weeks. Participants in the control group were asked not to stretch. Main outcome measurements Participants provided weekly on-line reports of outcomes over 12 weeks. Primary outcomes were any injury to the lower limb or back, and bothersome soreness of the legs, buttocks or back. Injury to muscles, ligaments and tendons was a secondary outcome. 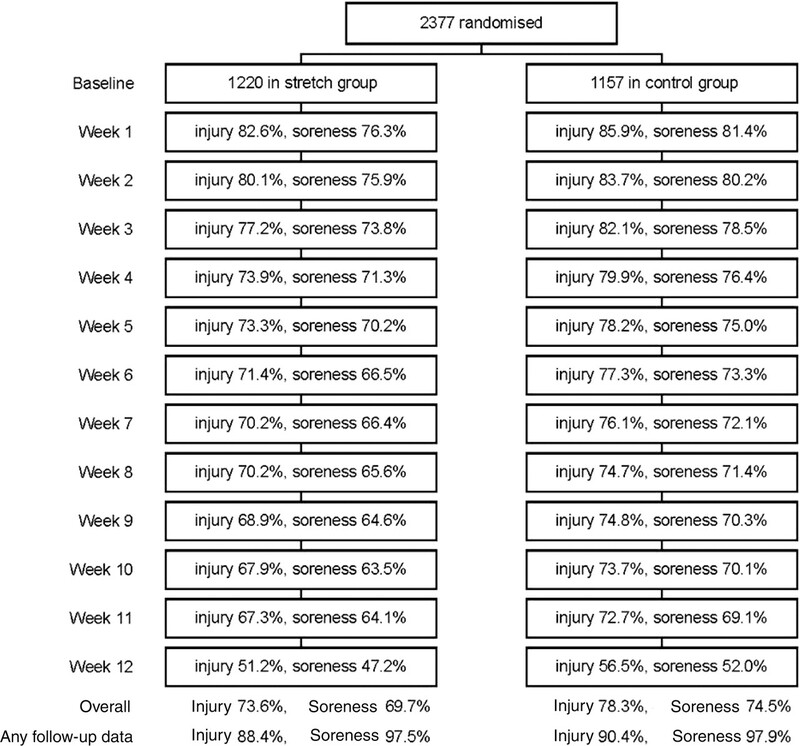 Results Stretching did not produce clinically important or statistically significant reductions in all-injury risk (HR=0.97, 95% CI 0.84 to 1.13), but did reduce the risk of experiencing bothersome soreness (mean risk of bothersome soreness in a week was 24.6% in the stretch group and 32.3% in the control group; OR=0.69, 95% CI 0.59 to 0.82). Stretching reduced the risk of injuries to muscles, ligaments and tendons (incidence rate of 0.66 injuries per person-year in the stretch group and 0.88 injuries per person-year in the control group; HR=0.75, 95% CI 0.59 to 0.96). Conclusion Stretching before and after physical activity does not appreciably reduce all-injury risk but probably reduces the risk of some injuries, and does reduce the risk of bothersome soreness. Many people stretch before or after exercise, generally with the expectation that stretching lessens postexercise soreness, reduces the risk of injury, increases the sense of ‘looseness’ or well-being, or enhances performance. Surprisingly, given the popularity of stretching, the effects of stretching have not been clearly established. Recently we systematically reviewed studies of the effects of stretching on muscle soreness published before May 2006.6 We identified 10 mostly small studies. Pooled estimates of effects were small and not statistically significant. For example, the effect of pre-exercise stretching was to reduce soreness 1 day after exercise by, on average, 0.5 points on a 100-point scale (95% CI −11.3 to 10.3; three studies). Postexercise stretching reduced soreness 1 day after exercise by, on average, 1 point on a 100-point scale (95% CI −7 to 5; four studies). Similar effects were evident between ½ day and 3 days after exercise. It was concluded that the best available evidence indicates that stretching does not reduce muscle soreness. The studies identified in these reviews have at least two limitations. First, the studies were carried out on populations that may not be representative of recreationally active people. The two trials of stretching to prevent injury risk enrolled army recruits undergoing basic military training and nine of the 10 studies of stretching to prevent muscle soreness involved participants in whom muscle soreness was induced with eccentric exercise in laboratory settings. It is not clear if the findings of these studies are applicable to the broader population of people who stretch before or after physical activity. A second limitation is that the existing studies of effects of stretching on muscle soreness have investigated the effects of a single session or a very short programme of stretching (maximum of 12 sessions over 3 days). However, the effects of stretching may accumulate over time, in which case trials of short duration may fail to detect real effects. Our informal surveys suggest that some people stretch before or after participating in physical activity because they feel it enhances their sense of well-being or ‘looseness’ or preparedness to exercise. These effects have not been investigated in randomised trials. We conducted a randomised trial of stretching in a community population of physically active people. Our primary objectives were to determine whether a programme of stretching before and after vigorous physical activity reduces risk of injury or soreness. Secondary objectives were to determine effects of stretching on severity of soreness and feelings of looseness during and after exercise, and to ascertain whether the magnitude of effects on injury risk or soreness depend on age, activity levels or beliefs about the effectiveness of stretching. The trial was a pragmatic internet-based randomised trial. It was registered prospectively (ANZCTRN: 12608000044325; full protocol available at http://www.stretchingstudy.nokc.no). As the study was entirely internet-based, it was possible to recruit a large and diverse sample of physically active people from a community population. The trial was managed from the main office in Norway and a second office in Sydney. Ethical approval was given by the University of Sydney Human Ethics Review Committee. The Regional Committee for Medical Research Ethics in Norway ruled that it was not necessary to obtain ethical approval from that body. Participation was open to people anywhere in the world who satisfied the following criteria: aged 18 years or over, able to read and write in English or Norwegian, takes part in vigorous physical activity on at least 1 day in the past week, and regularly accesses internet and email. People who reported a lower limb or back injury that restricted participation in vigorous physical activity were excluded. People were made aware of the trial through a television programme on health in Norway and a radio programme on health in Australia, as well as by email messages sent to individuals and associations. Potential participants visited the trial website and were screened for eligibility. Those who were eligible were asked to log on to the website on the following Sunday and complete a questionnaire about their age, physical activity, stretching habits and beliefs regarding the effects of stretching. After completing this questionnaire, participants were randomised to the stretch or control group. The randomisation schedule was unrestricted (no stratification or blocking) and was administered by computer. This ensured the randomisation sequence was concealed. As the trial was entirely web-based, there were no meetings between participants and investigators. Participants were able to contact the investigators by email if they had questions. Participants in the stretch group were asked to stretch seven muscle groups (gastrocnemius, hip adductors, hip flexors, hamstrings, rectus femoris, hip external rotators and trunk rotators) on both sides of the body before and after every occasion of vigorous physical activity. The stretches were designed by physiotherapists and physical training instructors. A detailed description of the stretches is available from the authors. Each muscle or muscle group was stretched using a static stretch of at least 30 s and was of sufficient intensity that, for the duration of the stretch, the participant felt a strong but not painful stretch. Thus, the stretching protocol took at least 14 min. The stretches were explained using images and text on the trial website, and participants were able to print out a credit card-sized pamphlet explaining how to do the stretches. Participants were asked not to stretch any other lower limb or trunk muscle groups for the 12-week period. Participants in the control group were asked not to stretch any lower limb or trunk muscles over the 12-week period. Participants in both groups were instructed to continue their usual exercise patterns and their usual stretching routines for upper limbs. Participants who, prior to the study, normally warmed up prior to exercise or warmed down after exercise continued to perform normal warm-up or warm-down routines unless part of the warm-up or warm-down procedure provided significant stretch to the lower limbs or trunk, in which case that part of the warm-up or warm-down was discontinued for the duration of the trial. The primary outcomes were time to injury and soreness. Each week, participants were asked if they had experienced a lower limb or back injury, even if the injury was unrelated to exercise. If so, they indicated date, type and site of injury, and the type of activity that induced the injury. Participants were also asked if they had experienced bothersome soreness in the legs, buttocks or back in the preceding week. The focus was on estimation of the size of the effect of stretching, rather than hypothesis testing. Analysis was by intention to treat. Missing soreness data were imputed by carrying the last observation forward and the first observation backward. A sensitivity analysis was performed to determine the degree to which imputation influenced the findings. The analyses of primary outcomes were conducted separately by two statisticians using different software: SAS v9.2 (SAS Institute, Cary, North Carolina) and Stata v9.2 (Stata, College Station, Texas). The allocation code was not broken until the analyses were compared and found to yield the same results. Time to first injury was compared using Cox regression. As not all participants completed all reports, we used a risk window approach that allowed the risk period for an individual to be interval-censored. Confidence intervals were calculated using robust (sandwich) variance estimators. Generalised estimating equations were used to estimate parameters of a linear model of the log odds of having bothersome soreness. The variables in the model were group membership, time and group-by-time interactions. Time was modelled as a categorical variable (13 time points dummy coded as 12 variables). A test of the effects of stretching on a second measure of muscle soreness used participants' weekly ratings of the severity of muscle soreness. Again, longitudinal models (mixed linear models with random intercepts for participants) were used. The same approach was used to determine the effects of stretching on perceptions of looseness. Additional secondary outcomes were time to muscle, ligament and tendon injuries and time to professional care injuries. Further analyses investigated whether frequency of physical activity at baseline, age or strength of belief in the importance of stretching modified (interacted with) effects of stretching on soreness and risk of injury. Age was entered into these models as a continuous variable. Altogether, two primary outcomes and 12 secondary outcomes were specified a priori in the analysis plan. A total of 2377 people were randomised to either the stretch group (n=1220) or control group (n=1157) between 21 January 2008 and 2 November 2008. The characteristics of participants are given in table 1. The mean age was 40 years. Nearly two-thirds were women, and over half reported their nationality as Norwegian. When asked what was the most vigorous regular activity, about one-third nominated running, and one-fifth nominated going to the gym. Participants engaged in physical activity a median of four times per week (IQR three to five times; table 2). The groups appeared to be well matched at baseline. Most participants provided some reports of injury and bothersome soreness (89.4% and 97.7% of participants, respectively). However, many participants did not complete all weekly reports, and not all reports were complete (table 2). The completeness of reporting is given in figure 1. Overall, participants completed 75.9% of the required injury reports and 72.1% of the required bothersome soreness reports. Completeness of reporting was similar in the two groups. Completeness of data. Participants were asked to record the presence or absence of injuries and bothersome soreness each week provided they had not been injured earlier in the course of the study and (for soreness data) did not report they had not participated in physical activity that week. Completeness in each week was calculated as the number of valid reports divided by the number of randomised participants who had not been injured and (for soreness data) did not indicate they had not participated in physical activity. Compliance was moderate. According to self-reports of participants in both groups, 59.2% of participants (38.4% of stretch group and 80.8% of the control group) always complied fully or almost fully with the target frequency of stretching (all sessions of physical activity for the stretch group, none for the control group), and 43.9% of participants (7.7% of stretch group and 81.3% of the control group) always complied fully or almost fully with the target duration of stretching (>10 min for the stretch group, none for the control group). Most of the other participants partially complied with the target frequency and duration. Less than 4% did not comply at all (table 3). Participants were also asked ‘How long did you stretch on each occasion in that week?’ They could respond ‘I did not stretch,’ ‘Less than 5 min,’ ‘5–10 min’ or ‘More than 10 min.’ Participants in the stretch group were defined as compliant if they always responded ‘More than 10 min’ and non-compliant if they always responded ‘I did not stretch,’ and participants in the control group were defined as compliant if they always responded ‘I did not stretch’ and non-compliant if they always responded they did at least some stretching. Altogether, 687 participants experienced at least one injury during the course of the trial (table 2). The incidence rate (counting only the first injury for each participant and taking into account censoring) was 2.41 injuries per person-year for all injuries, 0.77 injuries per person-year for muscle, ligament and tendon injuries and 0.36 injuries per person-year for professional care injuries. Just over one-quarter of participants reported bothersome soreness in any week (mean risk of 28.3% over the 12 weeks). Stretching did not have a clinically important or statistically significant effect on risk of all injuries (HR=0.97, 95% CI 0.84 to 1.13; p=0.69; table 2 and figure 2A). However, stretching produced small reductions in the risk of bothersome soreness. The effect was apparent in the first weekly report and remained nearly constant over the 12 weeks (figure 2B). The overall odds ratio (mean of the 12 estimates) was 0.69 (95% CI 0.59 to 0.82; p=0.003). The mean risk of bothersome soreness over the 12 weeks was 24.6% in the stretch group and 32.3% in the control group, so the risk difference was 7.8%. An analysis conducted without imputation of missing data generated very similar results. Effect of stretching on (A) survival from all lower limb and back injuries, (B) risk of bothersome soreness and (C) survival from specific injuries (injuries of muscle, ligament and tendon) of the lower limb and back. Stretching reduced the risk of muscle, ligament and tendon injuries (incidence rate of 0.66 injuries per person-year in the stretch group and 0.88 in the control group, difference of 0.22 injuries per person-year; HR=0.75, 95% CI 0.59 to 0.96; p=0.03; figure 2C). There was no evidence of an effect of stretching on professional care injuries (HR=0.95; p=0.76). Stretching reduced severity of soreness by a mean of 0.4 points on the 0–10 soreness scale (95% CI 0.2 to 0.5). It also increased the perception of looseness during activity by a mean of 0.3 points on the 0–10 looseness scale (95% CI 0.1 to 0.4), and increased the perception of looseness after activity by a mean of 0.4 points (95% CI 0.3 to 0.6). There was a statistically significant interaction between age and effect of stretching on all-injury risk (p of interaction term=0.039). Thus, the hazard ratio of the effect of stretching on all-injury risk was 0.75 (95% CI 0.56 to 0.995) in 20-year-olds, 0.97 (95% CI 0.84 to 1.13) in 40-year-olds and 1.26 (95% CI 0.94 to 1.68) in 60-year-olds. There was also a statistically significant interaction between belief in the effectiveness of stretching and the effects of stretching on risk of bothersome soreness (p of test of the 12 interaction terms=0.034). Thus, the odds ratio for the effect of stretching on bothersome soreness was 0.38 (95% CI 0.20 to 0.72) in people who strongly agreed that it was important to stretch when doing physical activity, and 0.82 (95% CI 0.66 to 1.02) in people who strongly disagreed that it was important to stretch. There was no evidence of any interaction between age and effect of stretching on risk of bothersome soreness (p=0.11), between belief of effectiveness of stretching and effect of stretching on all-injury risk (p=0.50) or between frequency of physical activity at baseline and effects of stretching on either all-injury risk or risk of bothersome soreness (p=0.17 and 0.26, respectively). This is the first randomised trial to examine the effects of stretching on injury risk and muscle soreness in a community population participating in physical activity. We found that stretching does not reduce the risk of all lower-limb injuries combined, although it probably reduces the risk of injuries to muscles, ligaments and tendons. Stretching produces small reductions in the risk of experiencing bothersome soreness. Stretching did not produce statistically significant reductions in all-injury risk. This finding is consistent with the findings of two earlier randomised trials which examined the effect of stretching on all-injury risk in army recruits undergoing basic training.10 11 Those trials found that stretching did not produce worthwhile reductions in all-injury risk. An analysis of secondary outcomes suggested that stretching produces statistically significant reductions in the risk of muscle, ligament and tendon injuries. In this population (estimated incidence rate of muscle, ligament and tendon injuries of 0.77 injuries per person-year) the effect was to reduce risk by 0.22 injuries per person-year. Thus, one injury to muscle, ligament or tendon was prevented for every 20 people who stretched for 12 weeks. The finding of an effect of stretching on muscle, ligament and tendon injury risk needs to be considered cautiously because muscle, ligament and tendon injury risk was a secondary outcome, and there was no evidence of an effect of stretching on the primary outcome of all-injury risk. If stretching had reduced the risk of muscle, ligament and tendon injuries without increasing the risk of other injuries, we would expect a reduction in all-injury risk. Nonetheless, it is plausible that stretching reduces muscle, ligament and tendon injuries, and it may be implausible that stretching increases other injuries. Other analyses suggested that stretching reduced risk more, in relative terms, in young adults than it did in older adults. Again caution is required when interpreting this finding because age was one of three modifying factors that we tested, and the effect was not very significant (p=0.039). It is also possible that the interaction could be explained by confounders. Stretching reduced the risk of bothersome soreness. In this population (average control group risk of bothersome soreness of 32.3%) stretching prevented, on average, bothersome soreness in one in 13 people each week. We observed statistically significant effects on severity of soreness and on looseness, but they were small. A recent Cochrane review of 10 small randomised studies concluded that stretching did not reduce severity of soreness. All but one of the studies included in the Cochrane review were laboratory studies that examined the effect of just one or two sessions of stretching on soreness induced by a laboratory exercise protocol. Despite the obvious differences between the earlier studies and the current trial, the findings of the current trial are, nonetheless, quantitatively consistent with the findings of those earlier studies. The pooled estimate of the effect of stretching from the four studies in the Cochrane review that measured soreness 1 day after exercise was that stretching reduced soreness by, on average, 0.1 point on a 0–10 scale (95% CI −0.5 to 0.7; data converted from the original 100-point scale), and the estimate from the current trial was that stretching reduced soreness by an average of 0.3 points (95% CI 0.1 to 0.4). There are at least two risks of bias in this trial. First, some participants did not provide reports of outcomes, and some participants who did provide reports supplied incomplete data, so altogether participants provided 75.9% of required injury reports and 72.1% of required bothersome soreness reports. Loss to follow-up can produce bias in randomised trials.12 However, it would appear unlikely that loss-to-follow-up has substantially biased estimates of the effects of stretching on soreness in the current trial because stretching appeared to reduce soreness from the first reporting week when there was relatively little loss to follow-up, and the effects remained nearly constant thereafter. A second risk of bias is that outcomes were self-reported, and the participants were not blind. We did find that the effect of stretching on risk of bothersome soreness was associated with strength of belief of the effectiveness of stretching. This could reflect biased outcome reporting, or it could be that some of those who benefit from stretching perceived this benefit prior to the trial. At baseline, about three times more participants agreed than disagreed that it is important to stretch when doing physical activity, so biases in reporting of outcomes, if they occurred, might have exaggerated the effects of stretching. However, there was no evidence of an interaction between effects of stretching on injury risk and strength of belief in effectiveness of stretching, and effects of stretching on risk of soreness were apparent even in those participants who did not believe in the effectiveness of stretching. The effect of stretching on risk of injury was not associated with strength of belief of the effectiveness of stretching. A second unusual feature of this trial is that it was undertaken in collaboration with a television programme in Norway and a radio programme in Australia. In addition, awareness of the trial was achieved through newspaper and magazine articles and the internet. Besides helping to recruit participants, collaboration with the media can help the public to learn about randomised trials and how to use results of randomised trials to inform decisions. Our trial stretches were similar to those often recommended before and after exercise.15 However, the protocol may have required participants to stretch more than they might otherwise. At baseline, 76.9% of participants who regularly stretched reported that they did so for a total (before and after exercise) of 10 min or less. While almost all participants partially complied with the stretch protocol, only 7.7% of participants in the stretch group always stretched for more than 10 min. These data suggest that many people may be reluctant to stretch for the durations commonly recommended and that recommended durations of stretch are unlikely to be achieved in practice. It is possible that larger effects would become apparent if participants stretched more, though we have no data to confirm that. The trial investigated the effects of 12 weeks of stretching. Thus, this trial can be used to make inferences about the short-term and medium-term effects of stretching on risks of injury and soreness, but it is not clear if the results can be applied to longer-term effects of stretching. The findings can be applied to community populations of physically active people but may not apply to professional athletes, who may be subject to different injury risks and may be able to stretch more intensely. We did not measure impacts on performance, which would be an important outcome measure for competitive athletes. Likewise the findings may not apply to people who seek professional care for a specific injury. Some people with specific injuries may benefit from stretching, but this is yet to be demonstrated in randomised trials. We gratefully acknowledge the assistance of NRK Puls (in Norway), ABC Radio National Health Report (in Australia) and the Friskis & Svettis organisation in Norway. K Skinner (Department of Public Health and Primary Care at the University of Oxford), HK Nylund and C Carling (Norwegian Knowledge Centre for the Health Services) assisted with the study. O Jensen, R Kværnbraaten, QA Alvi and T Gauperaa (Norwegian Knowledge Centre for the Health Services) designed and maintained the website.
. The efficacy of stretching for prevention of exercise-related injury: a systematic review of the literature. Man Ther 2003;8:141–50.
. A systematic review into the efficacy of static stretching as part of a warm-up for the prevention of exercise-related injury. Res Sports Med 2008;16:213–31. USA Track & Field. USATF stretch study. http://www.usatf.org/stretchStudy/ (accessed 26 March 2009).
. Stretching to prevent or reduce muscle soreness after exercise. Cochrane Database Syst Rev 2007; CD004577.
. Clinical trials: a methodologic perspective. 2nd edn. Wiley-Interscience: Hoboken, NJ, 2005.
. Applied longitudinal data analysis for epidemiology: a practical guide. Cambridge University Press: Cambridge, 2003.
. Clinical trials: issues and approaches. In: Shapiro TA, Louis Exclusions, losses to follow-up, and withdrawals in clinical trials. M. Dekker: New York, 1983:99–113.
. An internet-based randomized, placebo-controlled trial of kava and valerian for anxiety and insomnia. Medicine (Baltimore) 2005;84:197–207.
. A televised, web-based randomised trial of an herbal remedy (valerian) for insomnia. PLoS ONE 2007;2:e1040.
. Stretching. Shelter Publications: Bolinas, CA, 1980.
. Analysis and interpretation of treatment effects in subgroups of patients in randomized clinical trials. JAMA 1991;266:93–8. GRADE Working Group. Grading quality of evidence and strength of recommendations. BMJ 2004;328:1490. Funding The project was supported by the Norwegian Knowledge Centre for the Health Services and with a grant from the New South Wales Sporting Injuries Committee. RH was supported by a fellowship from the Australian NHMRC. The funders had no involvement in study design; in the collection, analysis and interpretation of data; in the writing of the report; or in the decision to submit the paper for publication. Ethics approval Ethics approval was provided by the University of Sydney Human Ethics Review Committee.